Mounesh.K son of Rangappa from Garbagudi village of Harapanahalli taluk of Davangere district, dropped out of school when he was studying in the 6th standard. After his father’s death his mother was unable to sustain the family of 5 children, hence Mounesh started working in a neighbour’s farm. In 1998 when Don Bosco Child Labour Mission started the Residential Bridge Course for child labourers, our social worker Heerya Naik identified the boy in the work place and spoke to him and his mother. The boy showed great interest in learning. He was brought to Don Bosco and was admitted to the Residential Bridge Course for his education. After one year he was readmitted to the Government school at Harapanahalli to the 7th standard and also to the Government hostel for scheduled caste students. He studied there till he passed SSLC, with 2nd division. DBCLM also helped him join PUC and was admitted to a private college in Harapanahalli. After PUC, he enrolled for Diploma in Education (D.Ed.) under the Government quota where he had to pay less fees. 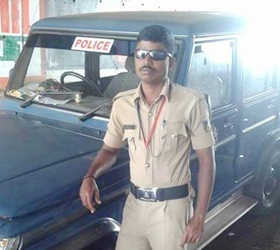 Alongside, he prepared for various competitive examinations and in December 2010 he was selected for the post of a police constable in Davangere District.